BOCA RATON, F.L. 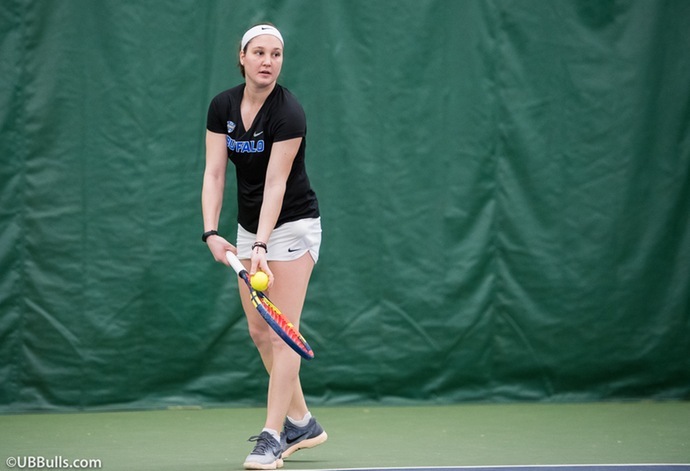 -- The University at Buffalo women's tennis team closed out a successful fall season at the MAC Fall Tournament this past weekend winning several of the flights in singles and doubles. The weekend was highlighted by a main draw victory from freshman Nikoleta Antoniou-Karademitrou in Flight B. After receiving a first round bye, she defeated Ellen Carney of Toledo, 6-1, 7-5, and then in the finals she defeated Tatiana Simova of ASA Miami, 3-6, 6-2, 12-10. Freshman Gabriella Kivovich won the main draw of Flight F beginning with a 6-2, 6-3 win over Julia Dmitrieva of Northern Illinois, followed by a 7-6 (5), 6-4 win over Claire Aleck of Toledo. In the finals, she defeated Akron's Alexis Steer, 6-2, 7-6 (2). UB had a ton of third place finishes in singles as senior Chantal Martinez Blanco won her opening match 5-7, 6-1, 10-4 over Jovana Peric of Norther Illinois before falling in her second match. In the third place match, she defeated Miruna Vasilescu of Akron, 3-6, 6-4, 10-3. In Flight C, it was an all-UB match for third place between junior Emel Abibula and freshman Pia Schwarz. Schwarz defeated Jemi Aguilar of Florida Atlantic, while Abibula received a bye. Both lost in their second round matchups and then Schwarz got the upper hand in the third place match, winning 6-0, 6-1. In Flight D, it was also an all-UB final between seniors Sanjana Sudhir and Arianna Paules Aldrey. Sudhir won her first match 6-2, 6-0 over Claudia Barboza of ASA Miami, while Paules Aldrey had a bye. After both lost their second round matches, Paules Aldrey won the third place match, 6-1, 3-6, 10-7. Senior Mercedes Losada Rubio finished in third place in the Flight E bracket as she won her first contest 7-6, 6-3 over Thalita Rodrigues of Toledo and she won her third place match, 7-6 (5), 5-7, 10-5 over Christy Robinson of Toledo. Junior Sydney Siembida found herself in the red bracket back draw of the Flight F bracket and she came away with a pair of wins as she defeated Narjis Mzibri of ASA Miami, 6-1, 7-6 (5), and in the final match defeated Julia Dmitrieva of Northern Illinois, 6-3, 6-4. In doubles action, the Bulls picked up a Flight C victory and third place finishes in both Flight A and B. In Flight C, Sudhir and Kivovich came away with the win as they began the weekend with a 6-2 win over a duo from Northern Illinois and then had a 6-0 shutout in the semifinals. In the finals, they defeated Chrissy Fuller and Claire Aleck of Toledo, 6-3. Losada Rubio and Abibula took the backdraw of Flight C with a 6-4 win over Ferndanda Naves and Christy Robinson of Northern Illinois. Antoniou-Karademitrou and Martinez Blanco finished third in Flight A as they opened the weekend with a 6-3 win before falling in the semifinals. In the third place match, they defeated DeeDee Leebabanchong and Kierseten Carlson of Toledo, 6-3. In the B Flight, Schwarz and Paules Aldrey won their opening match 7-5 and then in the third place contest defeated Ja'Cara Gillis and Jemi Aguilar of Florida Atlantic, 6-3. The Bulls will return to action when they begin their spring season on February 1 against Niagara.